This is my first ever rescue spotlight. I am so excited to share the story of some special rescue dogs and cats here, to give you a glimpse at pet rescue and how it works in such a wonderful way. I would like to introduce you to Ralph. Ralph is a 9 month old Terrier mix (American Staffordshire, Parson Russell, Miniature Bulldog and "other"). He is a very handsome dog with striking coloring and very cute ears! I am grateful that he was willing to be interviewed here. Ralph: I started life in Mississippi. I don't know why, but I was placed in a "kill" shelter there when my owners could no longer keep me. In December 2015 I was chosen along with many other dogs to make the trip from Mississippi to New York, in the hopes that I'd be adopted. Only a few days after I arrived at the Scottsville Veterinary Hospital/Animal Shelter, Karen Jones came and adopted me! Ralph: My first few days at the Jones household were very very exciting! I wasn't sure what was expected of me or where anything was. I even had to be reminded to go to the bathroom outdoors and not in! Karen and Owen were very tired keeping up with me all day. But after just a short while, I started to settle down. Karen and Owen got me a crate and I quickly learned to go in it when I needed a break. 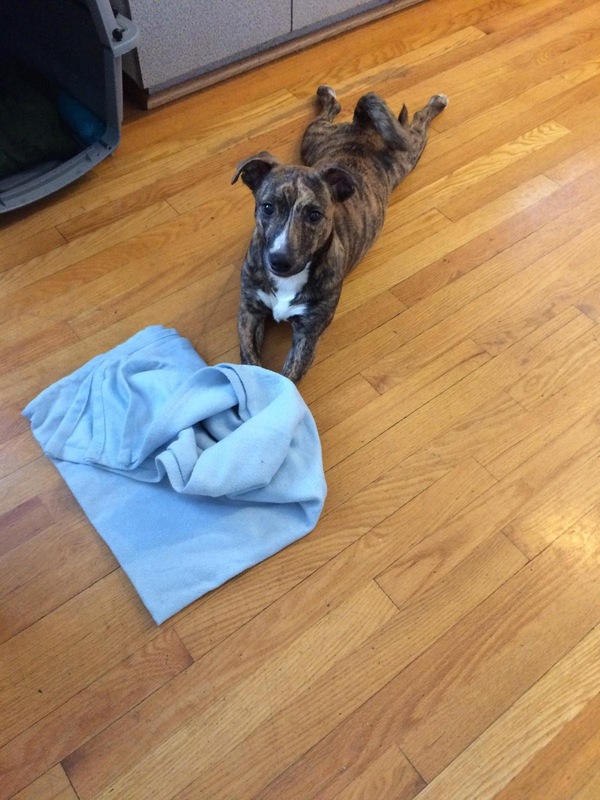 Ralph: Some of my favorite things are the soft blue blanket in my crate, tennis balls (I LOVE to chase them along with just about anything else!) and any kind of toy with a loud squeaker! I've also started going to doggie daycare a couple of days a week. There are lots of other dogs there and I absolutely love playing with them all day. I come home really tired! I also went to obedience class for six weeks and now I know "sit," "stay," "down," "come" and "heel." I like practicing my commands because I get lots of treats! Ralph: If I were giving tips to anyone considering adopting a dog, I'd remind people that puppies have LOTS of energy and need LOTS of your time! Be sure you're ready for that! I'm already a lot calmer than I was two months ago and I know I'll grow up into a great dog! 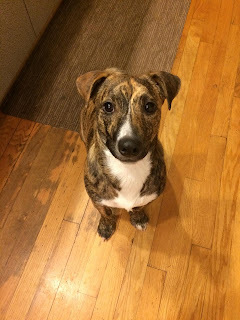 Karen, who is Ralph's Mom, shared a great story about Ralph's name: "Ralph's name was "Chip" before we adopted him. But we liked Ralph better -Owen's dog growing up was Ralph and it also reminded us of A Christmas Story - since we got him right before Xmas." I love that! Ralph is such a great name. 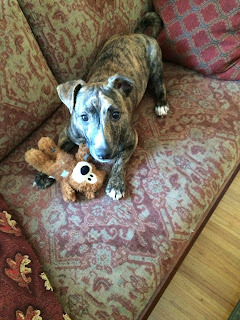 Thank you, Ralph, for visiting my blog today and sharing your story. I really enjoyed it, and hope that readers do, too. 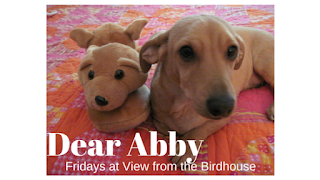 Readers, if you want to share your dog or cat's rescue story at View from the Birdhouse, please just leave a note including your email in the comments. Thanks for visiting today. I hope you have a wonderful weekend! Thanks for such a great interview, Abby! Such a cute idea! I have a rescue a they're the best. Have so much love to give! Sounds like he is a very happy dog now! What a sweet story! It tugs on my heart strings! How nice - Ralph is almost famous! We know he is well loved too! Hi Abby. Our cat Zeus would love to have his rescue story in your column. We had never had a kitty before, and really didn't think we were "cat" people. But having Zeus in our lives has been such an amazing experience. He has brought so much love and pleasure to our home & family. If you think your readers might like to hear more about Zeus, just let me know! This is such a fun cute idea!! Thanks for sharing! Thanks, all, for visiting! I was happy to help spotlight Ralph's story. He is a wonderful pup! Barbara, I would love to spotlight Zeus -- we sent you the info via email.